This is going to become a weekly thing. Just some quick notes about interesting things that have been floating around over the week and are worth a quick comment. 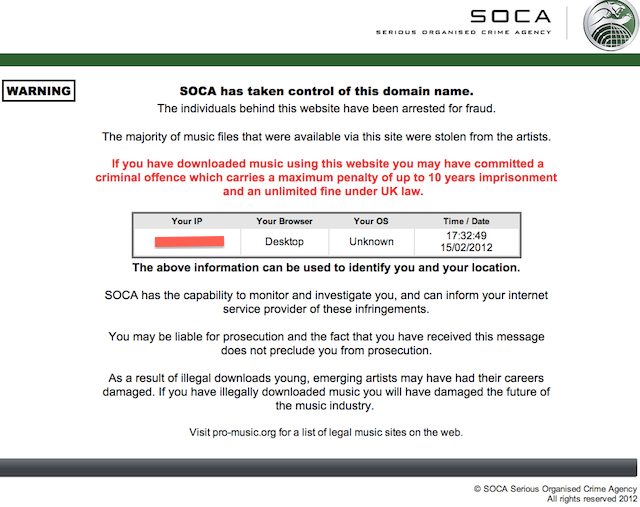 In addition to the fact that SOCA was clearly trying to intimidate internet users, they went on to use weirdly moralizing language “emerging artists may have their careers damaged… you will have damaged the music industry.” Finally, they direct people to pro-music.org which is a media propaganda site. Julie Cohen, a professor at Georgetown Law who specialized in Intellectual Property, released her most recent book “Configuring the Networked Self” under a Creative Commons ShareAlike license. I want to applaud her commitment here in glad there are more IP people (like Lessig, Doctorow, and Benkler) who put their money where there mouths are and follow through on Open Access stuff in their own work. Also, good for Yale Press for being on board with this. Here is some karma: you can also buy the book here. I haven’t read it yet, but after looking at the table of contents I plan to. Her piece got an endorsement on the always wonderful Slate Political Gabfest this week, and I figured I would pile on here. Also, it obviously reminded me of the fantastic book some of you may have read: The Victorian Internet: The Remarkable Story of the Telegraph and the Nineteenth Century’s On-Line Pioneers. ← CNN, Some Consistency Please?